Jack Liang Wang is born and raised in Shanghai. 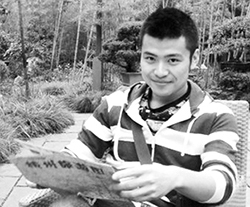 He received his Bachelor of Engineer degree in Shanghai, majoring in Industrial Design. He started to work as a CG artist in a video game company, following by furniture design in Herman Miller. In 2010, he moved to Hong Kong, seeking new life experience. Jack was trained in Chinese calligraphy since he was a kid, but he never gave up his passion in fine art painting. He attended part time classes for 2 years, and self taught and learnt most of the skills. Like many young artists, he was very bewildered about style at the beginning. Jack believes it is often easy to be lured into the idea by thinking ‘style’ is the most important thing for an artist or a designer, what matters more, is what it is shown in art and the life story behind every singular stroke. Repetition of such behavior in a consistent line will form and naturally evolve the ‘style’. Jack is continuously exploring and pushing the boundaries of both my work and many others’, and telling stories through product design and artwork. He believes that is a life-long journey, and one may never have a break.